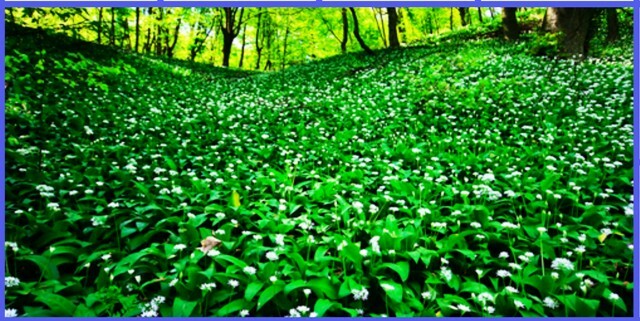 Wild garlic can be used raw in salads or more commonly to add flavor to soups, risottos, etc. It can be made into a pesto for later use. It’s one of my favorite spring/summer plants. 1. In a large saucepan, sauté the onion and crushed garlic in the rapeseed oil for about 10 minutes, until soft. Add the cubed potatoes, fennel and quickly stir-fry. 2 .Add the stock to the onion and potatoes. Add the nettle and salt, black pepper, pinch of cumin, nutmeg. Simmer until the potatoes are just soft, which will take 15-20 minutes, depending on the size of the cubes of potato. 3. Use the hand blender to liquidize everything in the pot to a smooth consistency. 4. 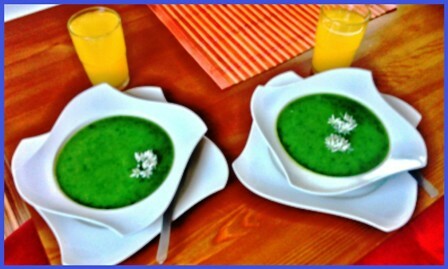 Take ½ litre of the »soup« in to a blender and add the wild garlic leaves. Blend them through (they will look finely chopped) and add the mass back to remaining soup. Stir well to combine the flavors. 5. Check for seasoning and add a squirt of lemon juice and freshly ground black pepper. Decorate with garlic flower buds. Serve hot. This soup is very rich in flavor, better than anything I have ever tried in restaurants. Very healthy antioxidant. Rinse leaves before use. Chop them to your liking and add them towards the end of your dish so it retains more flavor. You can also sauté it on olive oil or butter beforehand for a minute. Boil risotto rice (half to one cup per person) with just enough water (+1 tsp vegetable bouillon) that it’s mostly gone when the rice is done (commonly around 1 unit rice, 2 units water). Melt vegan butter in a pan and sauté chopped wild garlic (30-40g) and 2-3 cloves garlic for a minute, add a pinch of white wine and saute for 2-3 minutes. Add vegan cooking cream, season to taste (nutmeg makes a good seasoning here). Pour this into the risotto a few minutes before it’s done, mix well, cook until the rice is done. 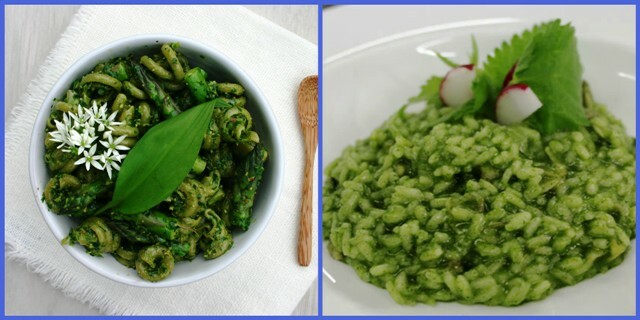 Chop 250g wild garlic, 3 garlic cloves, 200 g sunflower or pumpkin seeds, 1tbsp of pine nuts, mix with olive oil, season with salt and pepper. You can blend it all in a blender for a finer paste. Fill into a jar and top with olive oil.